Now this is the kind of girls’ getaways I’d like to see more of. What a wonderful family activity! 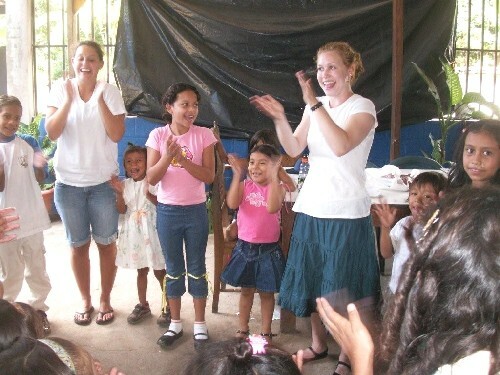 Allisa Whitman (left) and her sister, Rachel, surrounded by El Salvadoran boys. WHO: Allisa Whitman, 19, of Northampton, Mass., her sister, Rachel, 23, of Brookline, Mass., and their mother, Terry Phillips, 54, of Hollis, N.H.
WHY: To volunteer with Epilogos Charities helping the people of San Jose Villanueva. Allisa (left) and Rachel with Daisy Hernandez (center), a community worker in San Jose Villanueva. This entry was posted on December 4, 2008 at 9:31 am and is filed under Central America, Volunteer vacations, Where they Went. You can follow any responses to this entry through the RSS 2.0 feed. You can leave a response, or trackback from your own site.